This is Melissa with Moe Creations, guess what day it is??? 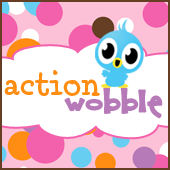 It's my day at the Action Wobble Blog, Woot Woot!!! OK so, who doesn't love Elmo????? OMGoodness, I think he is just one of the cutest puppets and he just brings out the C in Cute on this card, I just love him! Look at him shake his presents, lol, can you say "Adorable"!!! Thank you to an amazing GIANT!